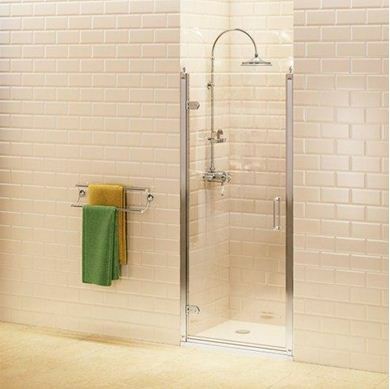 This beautifully crafted hinged shower door is manufactured and designed expertly by Burlington. The door is designed to be fitted into a recessed space and is available in various widths. All of the Burlington Shower doors and enclosures are 195cm high and can be adjusted by up to 2cm from the wall. The enclosures are constructed from serrated aluminium and 8mm toughened glass. All of the enclosures can be installed with a ball header or a flat plain finish to the top of the frame posts. Please note - The minimum and maximum size for the recessed doors are - 76cm (72-76cm); 80cm (76-80); 90cm (86-90cm).